You can now own the popular workshop series A 4x4 Is Born, presented by Mark Evans. The finished vehicle - drop dead gorgeous! our wheel drive vehicles are more popular today than ever before. With this in mind, presenter and engineering fanatic Mark Evans takes on a brand new "Is Born" challenge. The build is inspired by the late 1970s special vehicles, of which a limited run of only 25 were produced for the Swiss and French Army, and are quoted as being "the best Land Rovers ever made". Mark's aim is to take an old rust-bucket Range Rover rescued from the scrap-heap and transform it into the ultimate boulder-crawling beauty! The starting point is a 1985 four-door Range Rover that a mate of Mark's had rotting in a garage. This he totally strips back to the bones and, along with salvaged parts from other Land Rovers and Range Rovers, combines to create a very special hybrid. 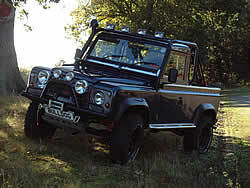 The extreme 3.5 litre, V8 powered, R380 gearboxed off-roader, custom built from scratch by Mark, also boasts some serious off-road kit, including: an outrageous hi-lift suspension system; a hand made, one-off roll cage; a specially modified twin-tank fuel system and air-operated diff-locks in both front and rear axles. The 2 disc DVD set contains all the footage from the Discovery series - all 300 minutes of it! World-renowned engineering enthusiast Mark Evans dusts off his overalls to take on his first off-road project - the transformation of a 4-door, 1985 Range Rover into a unique 100" wheelbase Land Rover. It's a 21st Century tribute to 25 special vehicles that Land Rover built for the French and Swiss armies in the late seventies. First Mark cleans 30 years of crud off his donor vehicle and gives it a mechanical health check. 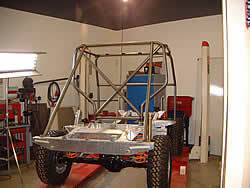 In the workshop, Mark buys the body panels, and sets about modifying the chassis to support it all. There's a lot of metalwork to be done. He starts with some new outriggers and quickly gets into a spot of bother ! Mark makes the brackets and plates necessary to fix the Land Rover bodywork to the strengthened chassis. Only one problem - the rear wheels don't fit under the wheel arches!! With so much metalwork to do, Mark calls in professional welder, Paul Harris to run a MIG-welding masterclass. There's also some TIG welding to be done to stitch up the seams on the new tub - it's a nightmare of a job ! Mark shows how to assess, renovate and upgrade the transmission. He rebuilds the axles from scratch, and shows in detail how to fit air-operated diff locks. Mark's attention turns to the front axle. He refurbishes the swivel joints and fits fused, 24-splie drive shafts and new cv joints. It's Mark's favourite part of the project - rebuilding and upgrading the monster V8! Cleaned, stripped of its ancillaries and decapitated, Mark assesses its condition. Mark visits a gearbox specialist to rebuild an R380 gearbox and transfer box from scratch for his project vehicle. Meanwhile, the completed, blasted chassis is galvanised by the hot-dip process. It's a very dangerous procedure but the finished chassis looks magnificent. The galvanized chassis arrives back at the workshop. When Mark has finished admiring it, he starts to fit the running gear ! First up: suspension. Mark continues playing with bushes, trailing arms, and panhard rods, before experimenting with springs and dampers. With the help of some "specialist" friends, Mark makes himself a unique roll cage out of the longest piece of tube he could fit in his van. He shows how to bend, assemble and fit it. Mark strips down and assesses the internals of his V8. Is it as really as good as he first thought? Mark cleans his pistons, prepares and lubricates the crankshaft and engine block. Mark shows in detail how to rebuild the 3.5L Rover V8, including fitting an upgraded cam. Then it's on with the heads ! Keen to learn another trade, Mark turns his attention away from his greasy old garage to attend a course for car painters at a multi-million pound paint shop. Mark paints his rocker covers and sets the variable valve timing kit on his newly assembled engine. Mark fits his core plugs, before venturing to his bench to show how to correctly remove a broken stud. Attention is then turned to rebuilding the oil pump. The clutch and gearbox is fitted to the engine and then unites the newly fitted clutch and gearbox to the engine. Mark then takes the strain as he fits the rebuilt engine/gearbox combo into the rolling chassis. Mark fits and assembles the bulkhead to the chassis. The wiring transforms from a jumble of multicoloured spaghetti to the vital veins of the beast's electrical system. Then it's back to school for Mark at the specialist paint shop. Mark's very special Land Rover is really starting to take shape, and he turns his attention to the brakes. Then it's on to the fuel system and there's a problem with the fuel tank filler. Mark fits his new racing exhaust with its ceramic coated headers and Y-pipe. Finally, Mark fits the ancillaries to the V8 engine. Can he get the monster to roar ? Mark can see the light at the end of the tunnel and continues fitting the renovated body work. One of the few "newish" bits of bodywork is the truck cab - but it too needs a lot of Mark's attention. With the project nearing completion, Mark throws off his overalls, and finds how to drive Land Rovers off-road. Not wanting his unique vehicle to be stolen under his nose, Mark invests in a state-of-the-art alarm system that will call his mobile of his Land Rover is touched ! He also makes his own tailgate, fits a powerful winch, side protection bars and snorkel. Oh. And forgets his Wedding Anniversary! Mark learns how to operate his new winch on an Off-road driving course. The racing bucket seats are fitted, plus the last of the windows and door panels; plus Mark gets all scientific when he uses lasers and a computer to set up his suspension geometry. Mark learns more about driving off-road on side slopes and in deep water to prepare him for the big day ahead, when he gets to drive his own Land Rover off-road for the first time ! It has been a journey of blood, sweat and tears that has taken Mark, Les and Phil (the team) 2500 hours to complete over 5 months. Mark put the finishing touches to his unique 100" Land Rover, before bringing it outside into the Spring sunshine. It's bright outside but it doesn't dim Mark's enthusiasm for fitting some extra lights ! Mark runs into a problem with his suspension while testing outside the workshop, but he gets its sorted in time for the big test. Off road, Mark has the time of his life at the helm of his latest creation. A selection of Land Rover enthusiasts with their vehicles, When Land Rovers Go Mad - extreme Land Rovers including the BirdCage, Stretched Land Rover and the floating Land Rover.